Light Painting is a fun way to make creative photos using only handheld lights like flashlights or glow sticks. In this three hour class, a mixture of lecture and hands on, guided, practice, we’ll learn how to set up a camera to make a light painting, and we’ll have a fun making our own photos. Besides being a lot of fun, light painting is a great way to gain an understanding of how light works, how to master the manual mode on your camera, and how to mix natural and artificial light in a photo. Once mastered, it is a fun technique to take outdoors and light paint parks and buildings! In class we’ll learn how to select the best camera settings for light painting, but please know how to put your camera in manual mode and adjust the: f-stop, shutter speed, ISO, and focus. Also know how to turn off ‘Long Exposure Noise Reduction’, if your camera has that. Light painting needs a camera in Manual mode. If you want to just come to watch and listen, and not practice, that’s fine too. 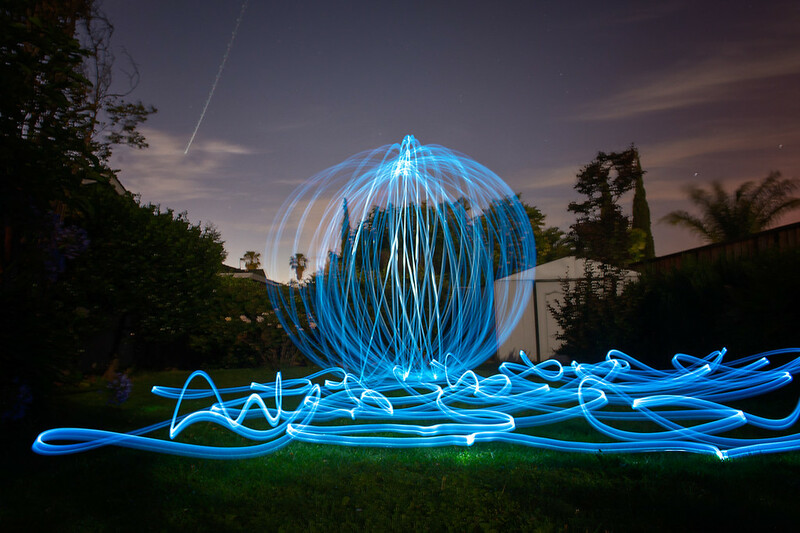 “Before taking Ron’s class I had never heard of Light Painting, but because he made it sound fun, I signed up. The class was more than fun — it was also creative and educational. Ron is a very good teacher because his instructions are clear and he’s very patient. His objective is to create a learning opportunity for photographers at all levels, and while Light Painting is not something I will major in, I can now say I not only know what it is, but I have done it.” – Pam P.